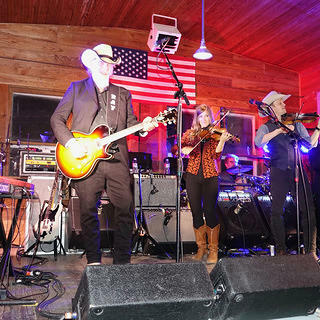 Without Texas’ historic dance halls, there wouldn’t be Texas music—so says Asleep at the Wheel frontman Ray Benson. Benson and his eight-piece Texas swing band have performed in dance halls all across the state of Texas. 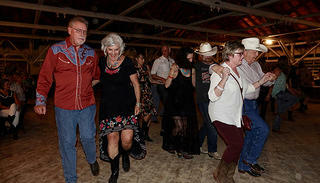 And this past March, they showed their support for these historic venues, raising funds and awareness for nonprofit Texas Dance Hall Preservation through their five-day Texas Dance Hall Tour. 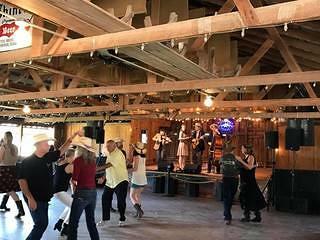 The tour, which ran from March 20-26, 2017, included stops at five different dance halls, with performances by Asleep at the Wheel, Lee Ann Womack, Dale Watson, Hot Club of Cowtown, the Quebe Sisters, Dale & Ray, High Plains Jamboree, and Heybale!. We spoke with Benson and Sam Seifert, the event director for the Texas Dance Hall Tour, about their week on the road. 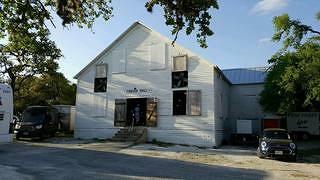 Read on for more information—and don’t miss our in-depth look at some of the dance halls east of Austin in the Spring 2017 issue of Preservation magazine. Dancing inside the 19th-century Twin Sisters Hall in Blanco, Texas. What inspired Asleep at the Wheel to organize the Texas Dance Hall Tour? RB: Well, we wanted to create what we felt was a truly special and unique Texas experience, inviting folks from all over the country to participate in a full week of Texas music, food, activities, and, of course, the dances in our amazing historic dance halls. Also, we wanted to raise funds and awareness for the Texas Dance Hall Preservation, so that we can make sure our dance halls are taken care of and are here for many years to come. Have you worked with Texas Dance Hall Preservation before, or was this your first big collaboration? SS: We have worked together before in the past for some of their fundraiser dances, but this was definitely a bigger event and collaboration than in the past. We felt the tour was a success and got a lot of great feedback and are looking to do it again this October. 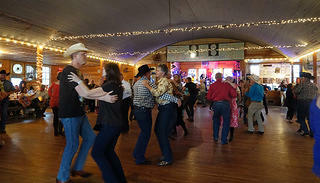 Luckenbach Dance Hall in Luckenbach, Texas, has been in operation since the 1880s. How many cities and dance halls were a part of the tour? RB: Every day on the tour we went to a new town and dance hall. 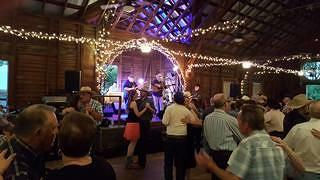 We played at five different dance halls on the tour starting in Blanco at Twin Sisters, then went to Fischer and played Fischer Hall. We of course went to the famous town of Luckenbach and played their wonderful hall. Then we moved the tour east and played in Schulenburg at Sengelmann Hall, and finally ended our tour in La Grange at Fair Pavilion Hall. 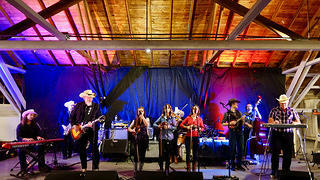 Asleep at the Wheel and the Quebe Sisters perform at Fair Pavilion Hall, built in 1925, in La Grange, Texas. 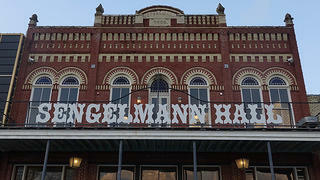 Sengelmann Hall in Schulenburg, Texas, was built in 1894. Lee Ann Womack performs at Sengelmann Hall. I saw your schedule—the tour looked packed with activities. What did the week look like? What were the different events and activities you hosted? SS: We felt that only offering dances in the evening wouldn’t be enough, so every day during the afternoon we offered activities like dance lessons, distillery tastings and tours, and tours of other dance halls in the surrounding areas. We visited Junk Gypsy and their amazing antiques store, and of course we had to make sure everyone was well fed with Texas BBQ and other Texas food staples. Fischer Hall in Blanco, Texas. 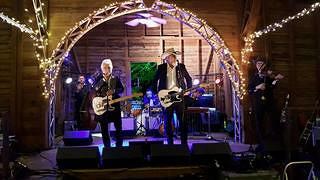 Dale Watson and Ray Benson perform at Fischer Hall. 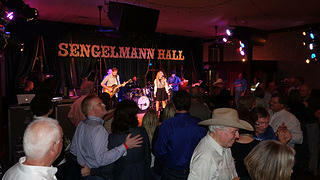 What is it that make Texas dance halls such special venues to perform in? Why do you like playing at these halls so much? RB: In our opinion, this is the birthplace of Texas music. From Bob Wills to Willie Nelson to George Strait, this is where we cut our teeth, playing for four hours entertaining and keepin’ people on the dance floor and having a good time. Also, the architecture and rustic beauty is also what makes them so special. Not one dance hall is the same, and they each offer something wonderful and unique to themselves. Was this the first time many people on this tour had encountered dance halls before? Were you able to expose a lot of new people to these historic venues, or maybe introduce longtime fans of dance halls to new halls or new elements of their history? SS: I know we had a lot of people who had been to a dance hall or two before, but I also know we took them to dance halls they had never been to, or even heard of before. We wanted to showcase all the halls, from the ones everyone knows to the smaller, lesser-known halls. The daytime tours that Texas Dance Hall Preservation did really gave our guests a deep insight into the culture and history of each hall, and I know everyone really enjoyed getting to hear about the history. Overall, how did the tour go? Were you pleased with the turnout? SS: We were thrilled to have so many people from so many different states—that really surprised us. [There were people] from California, Wisconsin, Washington, Florida, etc. It was just really great to see the interest from [all over] in our Texas culture and music. Probably the biggest surprise was being filmed at Twin Sisters [in Blanco] for NBC’s coverage of the golf tournament in Austin, The Dell Match Play. They wanted to show a teaser of what it would be like to be at a dance in Texas, so they came down and filmed us and showed off the hall and the dancers. Dancing at Fair Pavilion Hall. SS: We are going to be announcing shortly our Fall Tour, coming up in October . We are still putting together the logistics, but we’re excited to continue to offer what we feel is a great week of Texas fun. To make sure to get all updates and information, you can go to www.texasdancehalltour.com or our Facebook page, and sign up for our newsletter updates. We hope to keep doing these tours for many years to come, as there are still hundreds of different regions and dance halls to showcase!